Duchess Kate: Kate Loves: Prince George! 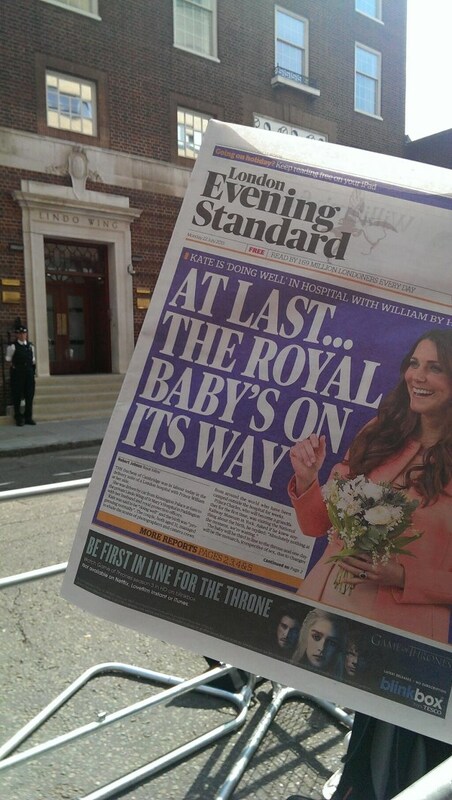 Royal watchers will vividly recall this time last year, when the world's media gathered outside the Lindo Wing of St Mary's Hospital in Paddington awaiting the arrival of William and Kate's first baby and the future heir to the throne. It was dubbed "The Great Kate Wait" by the press who took up residence outside the hospital for two weeks. On the 22 July 2013 shortly after 5.30 a.m. reports began to surface that Kate had been admitted to hospital in the early stages of labour. There was enormous excitement as the news was confirmed by the Palace. 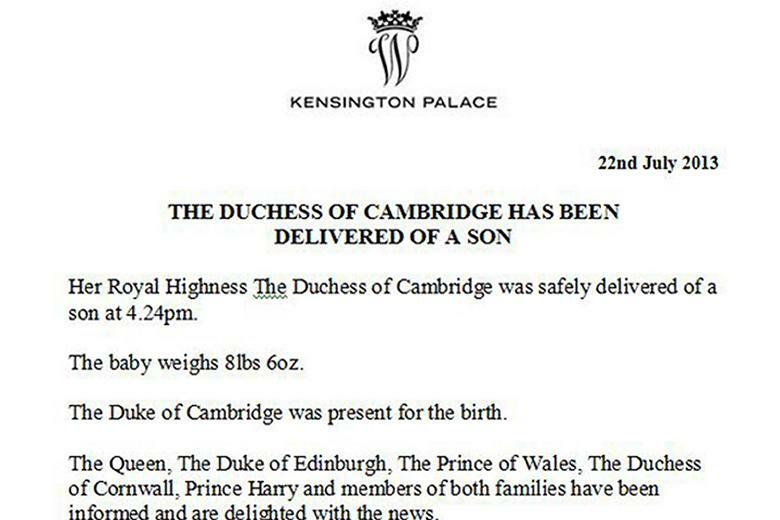 At 8.30 p.m. that evening the Palace released a statement reading: "The Duchess of Cambridge has been safely delivered of a son at 4.24 p.m. The baby weights 8 lbs 6oz". William and Kate decided to wait for four hours before telling the press their joyous news. It gave the couple time to share the news with their families and to enjoy those first precious hours with their baby. In a brief but perfectly apt statement William said, "We couldn't be happier." The next evening, following a visit from Prince Charles and Michael and Carole Middleton, proud parents William and Kate presented their son Prince George Alexander Louis of Cambridge to the world. 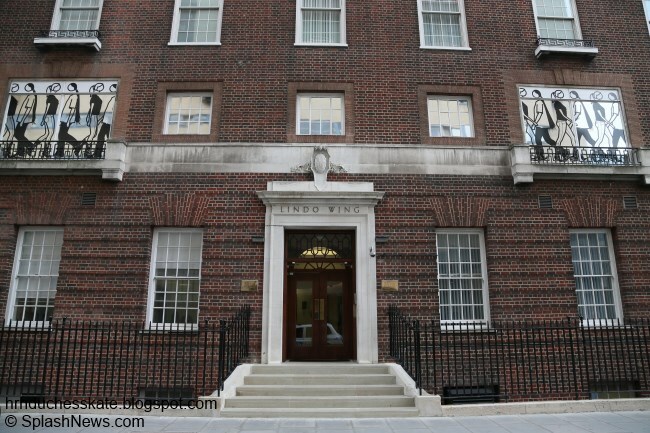 The Duke and Duchess looked overjoyed as they walked out onto the steps of the Lindo Wing. 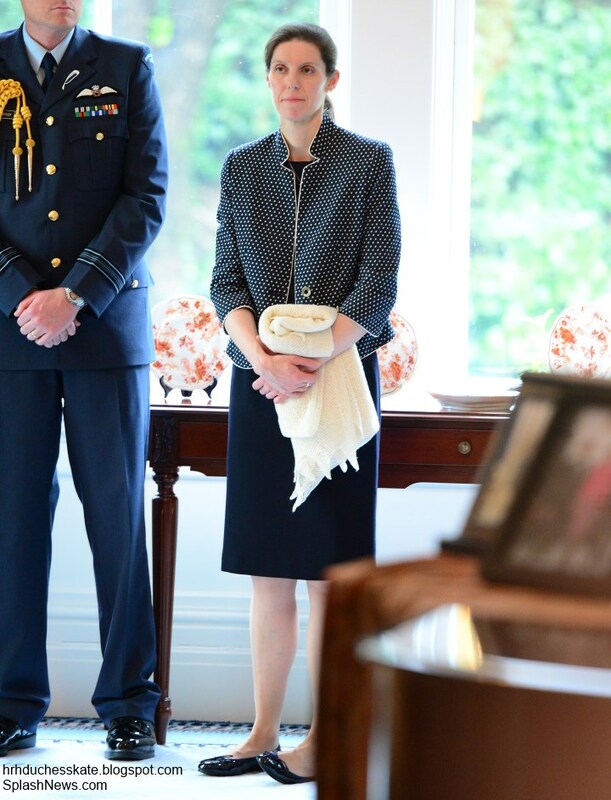 'The Duchess said: "It's been very emotional. It's very special. Any parent will know what this feeling is like." While Prince William revealed: "He's a big boy, quite heavy. We're still working on a name. He has a pair of lungs on him that's for sure." Confirming the Prince was overdue the new father said: "I will remind him of his tardiness when he's older," and with a broad smile William added, "He's got her looks thankfully" to which the Duchess replied, "No, no, no, I'm not sure about that." The Prince also jokingly said, "He has more hair than me." The headlines the next day were dominated by only one story. The trio spent the night at their then Kensington Palace home, two-bedroom Nottingham Cottage, where The Queen and Prince Harry met Baby George. The Cambridges decided to spend their first weeks with George at the Middleton family home in the leafy village of Bucklebury. The Palace revealed, "They are keen to enjoy some private time together, like any new family. They want to get to know their son." Kate is incredibly close to her family and William equally so, so it was no surprise they wanted to enjoy such an important time with them. As we know William and Kate are fiercely protective of their privacy and the Middleton's Georgian mansion offered an escape from the press and paparazzi in London. Kate's parents purchased the seven-bedroom manor in 2012. The well-protected home boasts a tennis court, an outdoor swimming pool, scenic gardens and a nursery decorated by Carole. It is understood they enjoyed a wonderful time in Bucklebury where Michael Middleton took the first official photos of his grandson... later revealed to some rather harsh criticism (Ok, Ok, perhaps from the view of professional photography they weren't perfect, but there was something rather charming about seeing the new grandfather's snaps). When William's leave ended, the couple took George to their Anglesey farmhouse where Prince William completed his time as an RAF Search and Rescue pilot. The family enjoyed the normality and privacy they have always loved the scenic island for, with strolls on the beach and hosted family dinners when the Middletons visited. 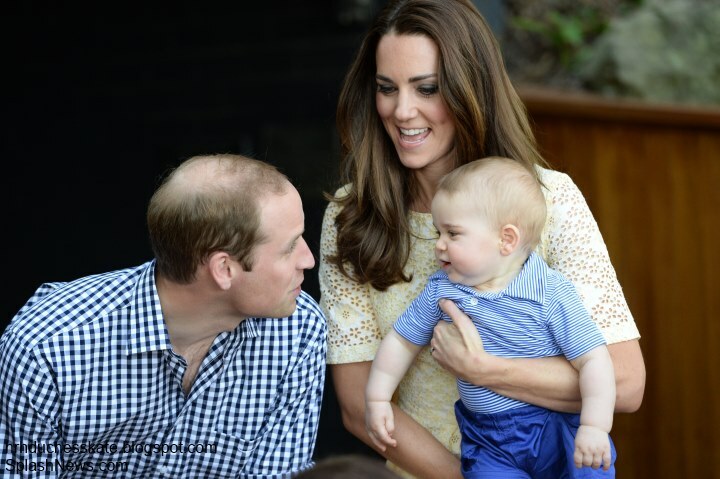 Kate would later reveal "William was a away a lot when George was young. The first five months were tough but you just get by". In mid-August it was reported William's old nanny Jessie Webb had come out of retirement to help the couple as they made the transition to living full-time in London and leaving Anglesey permanently. We next saw Prince George on 23 October for his christening at The Chapel Royal, St James's Palace. 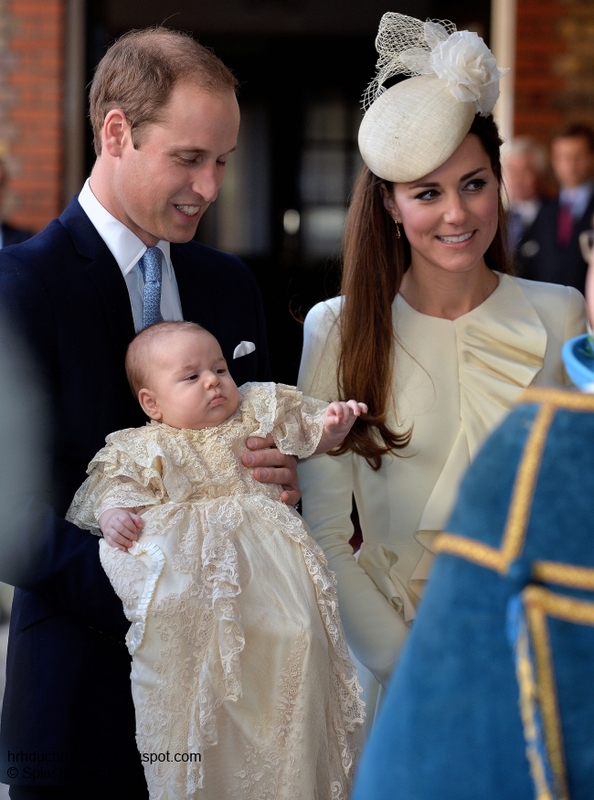 A christening is always a special family occasion; exactly what the Duke and Duchess wanted. Opting for an intimate christening they invited just twenty-two guests including their closest relatives and George's godparents. Their closest aide Jamie Lowther-Pinkerton, Zara Tindall, Diana's friend Julia Samuel, Hugh Grosvenor, and friends Oliver Baker, Emilia Jardine-Paterson and William van Cutsem. As they family settled into full-time life in London Kate returned to royal duties while William began a transitional year which included a ten-week agricultural course at Cambridge University. Christmas was spent with the Royal Family on the Sandringham estate where little George - who according to his parents was quite loud at the time - was the centre of attention. 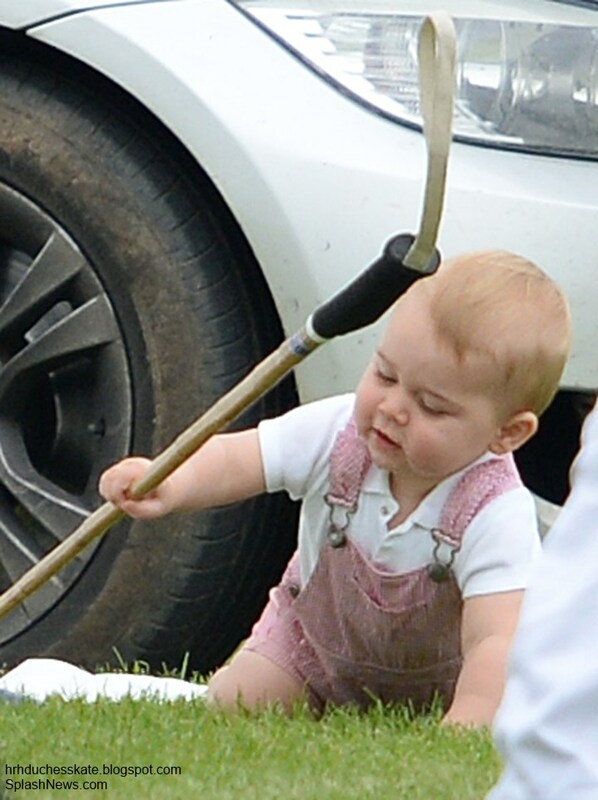 In February, Kate took George to Mustique for the Middletons' annual family holiday. To mark Mother's Day the Palace released a family photo. The informal family portrait was taken at a window in the family's home, Apartment 1A, Kensington Palace by award-winning photographer Jason Bell. Eight-month-old George looked adorable in a baby blue cashmere jumper with his name embroidered on it. George's trip to Mustique was thought to be in preparation for The Duke and Duchess of Cambridge's royal tour of New Zealand and Australia. The much-anticipated tour offered the public the opportunity to really see the adorable tot interacting with his parents for the first time. The tour itinerary was planned with George in mind and included only two evening engagements. An engagement was planned in both countries to include George and as you all know, they turned out to be the most popular of the tour. The couple decided in advance they would be taking their son with them and hired Spanish nanny Maria Tereasa Turrion Borrallo as a full-time, live-in nanny to accompany them on the trip. Maria Tereasa, who trained at the prestigious Norland College, was said to be "happy and delighted she came on board". 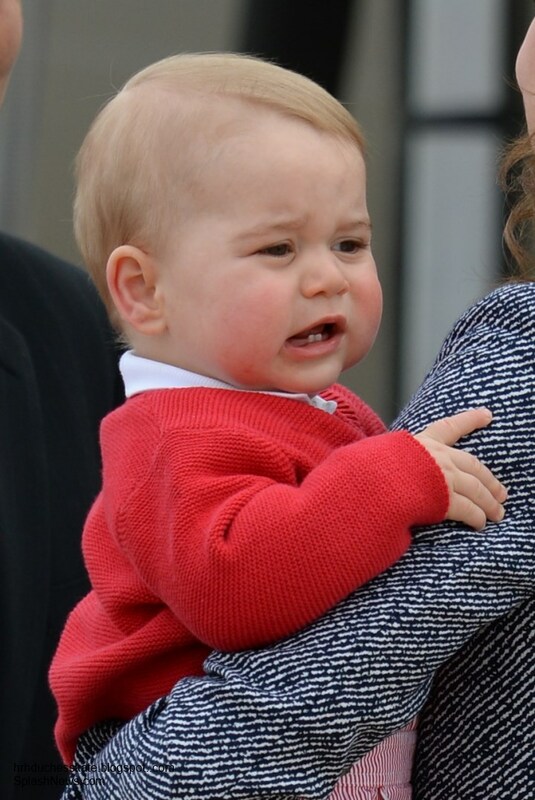 Little George quickly became affectionately known as "Cheeks" among royal fans and very much stole the show throughout the tour. The highlight of the tour for me was the family trip the trio enjoyed at Taronga Zoo where George met a bilby much to his delight. This photo is perhaps my favourite of William, Kate and George taken thus far. Despite the extraordinary circumstances, William and Kate enjoy as normal a life as possible in London with George. William is said to take his son for very early morning walks through Kensington Gardens at 5.30. Kate had been photographed enjoying strolls in the park with her son several times. Weekends are regularly spent with the Middleton family. Recently during a weekend in Buckelbury they all enjoyed a family day out at Bucklebury Farm Park managing to go relatively unnoticed and unphotographed. The park offers a magical experience and a great day out for the whole family. If George's reaction to the bilby is any indication, we can guess he thoroughly enjoyed meeting all the animals. For Father's Day Kate and George supported William at a charity polo match. The little Prince had a blast crawling and walking as he held on to his mother's hand. 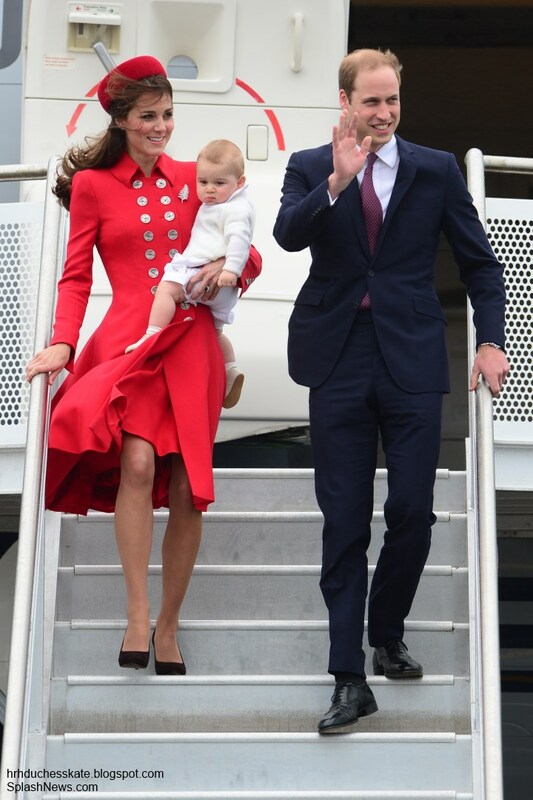 As George approaches his first birthday later this month it appears it will be another busy year for the Cambridges. It is very much thought Prince William's transitional year has led to a decision that royal life is not for him just yet, and he is expected to take a full-time post with the East Anglia Air Ambulance in the autumn. This will most likely see a reduction in royal duties for the couple as they base themselves at their Georgian home on the Queen's Sandringham Estate - Anmer Hall. Extensive renovations and security measures have been underway ensuring the family home is ready for the trio come September. It would seem a life away from the public and media glare is what the couple want for themselves and George, meaning full-time royal duties for William and Kate are most likely years off. A senior royal aide recently told journalist Richard Palmer "Their staff are looking for any excuse to stop off-duty photos of the family being published". With privacy at the forefront in their minds, this is not a surprising move, however, it is one that will bring criticism from many who believe it is time William and Kate took on a larger schedule of duties. 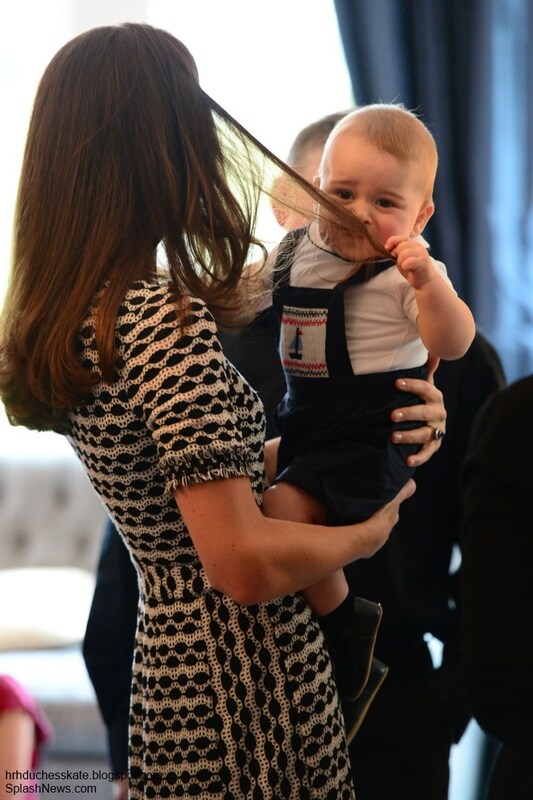 With a move to the country on the horizon, it is also quite possible George will have a brother or sister in 2015. We expect George's first birthday will be a memorable family affair celebrated with their nearest and dearest. It is believed the couple are planning a "low-key family celebration". Pippa Middleton wrote a piece offering tips for a one-year-old's birthday on the Party Pieces website: "Your one-year-old will feel most at ease with people they know well, so keep their first birthday party familiar and intimate". We wish Prince George a very, very happy first birthday next week! Such an appropriate 'Kate Loves,' very nice Charlotte! I cannot believe it has been a year! 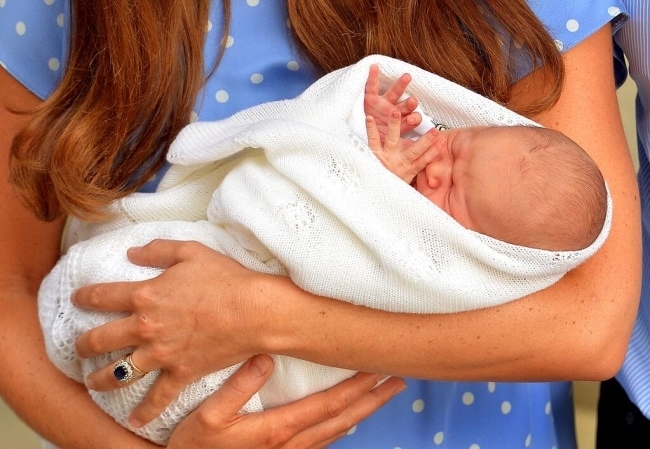 I can remember checking your blog right before bed and early in the morning to see if Kate had finally gone into labor and now George is so big, I can only imagine how his parents feel. I do want to add, probably with some criticism from others, that I wish William and Kate would increase rather than decrease their royal engagements come fall. I can understand wanting privacy and free time with a young child at home, but it just seems like the public demands more from them and I really feel like they're not in a place to refuse. They are the modern face of the monarchy; aside from Queen Elizabeth they and Prince Harry are the reason so many people are interested in the royal family again. I hope they use that to their advantage and make wise decisions instead of isolating themselves from the public that creates even more criticism. Agree with you Anonymous. This is a lovely post! Really enjoyed reading about George and hope he grows into as confident and charming a little character as Estelle in Sweden is. Judging from Australia and polo, he is off to a great start, brimming with personality, curiosity and a sense of adventure! One thing we might think about is this: It is not the job of the British monarchy to cater to public demands. In the present climate of social media we must remember that the British monarchy is not simply a branch of Reality TV with crowns and tiaras and occasional cliff-hangers concerning publication of salacious photos. They are in a position to refuse public demands. William, especially because of his mother, will refuse to play to the public as much as he can. He will also be sensitive and refuse to upstage his father and grandmother. William & Kate are still learning (and likely being kept in) their place. Now, if the Queen wanted William & Catherine constantly on the royal stage--then they couldn't refuse. That said, the Firm does know how important good PR is and how damaging bad press is. At the moment, the honeymoon phase for William & Catherine is waning. One of the things that does not help and is not being done well is publication of what W & C have done under the radar. In addition to publishing up-coming events & tours alerting the media to photo ops, court circulars might do well to include meetings and appointments conducted without fanfare or media presence each week. If they were to include items such as charity board meetings, briefing meetings with the reconnaissance & support teams for the upcoming Malta visit and the like, the insatiable public would see that work is being done where it isn't immediately apparent. However, even if that were done some members of that same insatiable public likely wouldn't understand that numerous hours of fittings and wardrobe planning (especially when she's taking the same old shoes and skinny jeans every time) are any work at all. What can be so hard about reading a few files about people she's going to meet for 2 minutes? Why can't the Duchess just go with the flow and simply wing it? How hard is it to shake a few hands and smile for a few photographers? What does she need to do in advance when everyone is doing it for her? People are like that. Which is maybe why the Firm's PR machine doesn't bother. In many ways, the British monarchy doesn't have to worry as it isn't going anywhere fast. The sine wave of its popularity will roll along and if it's down now, it will be up later. To know that all you have to do is remember your history. Even recent history. Philly, I would agree that it is not their job to *cater* to public demand (certainly not like trained seals), but they cannot give the impression that they are ignoring public sentiment. I think there is a happy medium that their PR team has not found. I agree with you about everything they do being put out there. Definitely! It will not satisfy ALL the people, but it will go a long way with most of them. One more thing... sometimes the best PR is free. A perfect example of opportunities missed: a couple of the "dry spells" when the public was waiting for photos of George. Wish I could completely agree but a sanguine monarchy is a monarchy whose fortunes could alter rapidly in a changing world. Certainly, no one wants the monarchy to resemble reality TV but any monarch hasto be constantly mindful of public opinion. And the monarchy needs to be visable to the people, and has needed to long before there was social media or even a press. Other monarchies are mindful of this and are making sure their public sees their future, not just their present. While this won't happen in Britain, at least not with the queen and most likely not at all, abdication, has been used recently in the Netherlands (where it is traditional) and in Belgium, Luxembourg and most recently Spain. This is to both give the younger members of the family an earlier chance but also to keep the monarchy fresh and more youthful in the public's eye. In the Scandinavian monarchies, the faces of the younger heirs are constantly out on tours and engagements, right down to little Estelle. As Gilbert has the pirate king say in Pirates of Penzance "many a king on a first-class throne, if he wants to call his crown his own, must manage somehow to get through more dirty work than ever I will do." While hopefully, not dirty work, no monarchy, not even the British one, can assume they can do as they please without thinking of public reaction. William and Kate are at their peak of popularity. They are not likely to be as popular in another decade when they are in their forties, even less so when they are in their fifties. Just ask Charles, or Andrew who once were as popular as William and Kate. (Andrew, once so glamourous, has fallen particularly hard.) The only thing worse than being overly loved and overly popular is not being loved or popular enough. Older members of the royal family who are loved and respected like the Queen and Princess Alexandra built up their reputation from a young age. I have no doubt of the survivial of the monarchy as long as the queen is alive and shortly following when there wll be a coronation. As long as Kate has babies, there will be interest as there will be in Harry's future. After that, is far less certain. I personally have always been a huge supporter of the monarchy and very much want its survival but the advent of a world media, easily avaiable, means people ask questions on issues such as equality that might not have come up as little as two decades ago. I completely agree with you that much, much better PR is needed but it can only do so much. And while popularity does ebb and flow, you never want to fall down a cliff to steep to climb again. Most monarchies that have fallen have done so by assuming it couldn't happen and taking their subjects for granted. I wouldn't like to see that happen here. Honestly, there everyone has just has years and years to abuse Prince Charles and make a laughing stock out of him for sitting around and waiting to become King... even though he has been a full time working royal every single minute of every single day of all those years. They've already seen had proof that this model doesn't garner respect from the public or make the King in Waiting happy and fufilled? I give them credit for paying attention to what works and what doesn't and adapting. It's interesting how they've managed to survive this long by adapting and yet everyone sits around accusing them of not adapting at all. Andrew did not fall through dereliction of duty. He was in fact quite active, and still is. His problem is with the company he keeps. Charles was much less of a laughing stock when married to Diana. He made quite a number of decisions that caused the public to lose respect. Andrew certainly didn't fail when it came to duty. Actually, many businessmen say he was an excellent trade representive. It just took a couple of bad connections and, perhaps more importantly the idea he took too many freebies and is "Airmiles Andy" for public impression to turn on him, The same could happen to Kate should "Duchess Dolitte" get too cemented in the public mind. anon from Leo (05:17)... your statements regarding Charles, in particular, hit the nail on the head. Perfect summary. Thanks AnonLeo for informing and instructing us with such perfect focus on what's truly jmportant--the facts. There will be quite a while until William and Kate will get even close to becoming King and Queen. I am so pleased to know they focus on the moment and not waist these precious moments in their life as a family. No royal duties will ever replace that. I salute them for their choices. And long live the queen! Thank you for this beautiful post Charlotte. God bless you and God bless little angel George. Wonderful article about Prince George and the Cambridges. I'm looking forward to new photos for George's first birthday. It's been an eventful year for the couple. I wouldn't be surprised it William did officially sign on to the air ambulance. There has been talk that if he did a 4/3 work shift, he would have time to do some appearances; Catherine is said to want more appearances, and if she does, I think it will help with any criticism of the two. I don't really mind that they aren't as busy, since William's grandparents, father and stepmother and the rest of the family still do carry out so many duties. Lovely post, Charlotte! Thank you! Yay!! I am sooo very happy that there is a new Kate Loves post!! I sent an email to Charlotte not to long ago asking for a new Kate Loves post and I must say this one is perfect!! I love reading about Georgie and about his 1st year. the time sure went fast! His birthday falls on my grandfather bday and my in-laws wedding anniversary. Also it's 2 days after my birthday( isn't this another commentors bday also??) So it's a time to Celebrate! ( my husband bday is on the 28the so July is a busy month for birthday's especially between both our families)!! I can't wait for a new post, especially a new Kate Love's! They are some of my favorite posts!! Lovely post Charlotte. I really am looking forward to George's one year old picture! Their first royal duty is to give heirs to the crown. I will not blame them for building and protecting their family as much as they can. That does not mean that they will do nothing. I am sure they will take part in some ceremonies and events. I remember Kate's first and atrocious months of pregnancy resulting in the death of the poor nurse not to speak to Kate's continuous sickness as well. And also I remember very well all those paparazzi preying after the royal couple, publishing obscene photos on yahoo as to the position Kate will choose for labour and giving birth. Should another pregnacy happen I wholeheartedly understand that this time, they will have it announced THEIR way after the three regulatory months. "The right to privacy is our right to keep a domain around us, which includes all those things that are part of us, such as our body, home, property, thoughts, feelings, secrets and identity. The right to privacy gives us the ability to choose which parts in this domain can be accessed by others, and to control the extent, manner and timing of the use of those parts we choose to disclose." This quotation is part of the Humans'Right. It applies to all. Why should members of the Royal Family being denied this right in their most intimate moments? Very well said anon 20:54 (you should put a name, that is a statement to be proud of IMO). I too believe the invasion of privacy was over the top, especially during her pregnancy. She had so much to deal with already, concerning her health, the last thing she needed was her (actually, their, PW) privacy invaded like that. Again, well said. On another note, has anyone else had any problems with posting comments or the site not fitting the size of your phone, tablet, etc? All day I have been trying to read this post and comment, and for some reason it wouldn't fit my screen like it usually does. I checked my settings and they were set to conform it, so I couldn't figure out why it wasn't. So very frustrating!!! Finally, just now, it is working like it usually does, thank goodness! I was about to go batty, lol! And to top it all off, I went back to work today and got into an argument with my bosses daughter (who think SHE is the big boss), after she embarresed me in front of another employee! Sigh, bad bad day. Glad this is working now, I needed to vent very badly. Sorry, but thank you for listening. You dear friends of mine are so sweet and caring, I know you wouldn't mind me getting it off my chest. If anyone did mind, hope you just skipped over this part, lol. Again, I'm sorry, but thank you anyway for everything. Jo, Marg, Leo, Bluhare, Florence, Esti, Royalfan, Jennifer, Camilla(if your out there), Eve, and everyone else: I hope you are doing well and I hope everyone is having decent weather also. Take care my friends and ty again for listening to me vent! OHH!! JENN, bosses´s children are the worst thing on earth...Don´t worry...you know we are here at your complete disposal...YES , SIR!!.. a big huge!! Thank you, Jenn. Doing well (although a bit hot!) here in the Pacific NW. Condolences on posting problems to one and all from one who is really familiar w/them! Today it's taking 4-5 tries per post! Jenn, sometimes people act big because in reality they feel rather small. It doesn't make it easier to deal with, but try to keep that in mind. We all know one of two! LOL. Thank you so much Esti! Huge hug back at you! Yvw Bluhare, so sorry your having to deal with hot weather. I didn't know it was supposed to get that hot in the NW. Is that normal Bluhare, or just the weather acting weird like it is everywhere else? Thank you Jo, I will definetly try that. I love the smell of lavender anyway :). Royalfan--So true! I've even had days like that!! But now and then wearing a little lavender oil can calm the nasty people around you!! Jenn-- see reply to Royalfan! Jo, I will give it a try. Thank you! :) Btw, I have Yankee Candle's "French Lavender" and I love it! Royalfan- Yes, that is very true, and you are absolutely correct, I do know both lol. Yeah, I definetly think "bosses daughter"(being nice, not what I call her in my head lol) falls into that catagory! Oh, and I love those candles you mentioned! Going to try to find Frnech Lavender when I go to the store this afternoon. how can they reduce the amount of royal engagements they do more??? they do almost nothing already! I'm struggling so hard at the moment to like and support them and I've never thought I'd feel this way, but they're just doing all the wrong things right now. I have not been able to participate lately but had a minute this morning. I think this is Charlotte's best post. Lovely way to start the day. fect way to anticipate George's first birthday ! JENNIFER from Wisconsin-please see my comment further down @18:46 that was supposed to appear here. Just want to be sure you know we are glad to hear from you. Happy to see you are back and alright Jennifer! We were becoming concerned about you! Hope to hear from you again soon! Take care! Wonderful post, thank you Charlotte! I can't believe how fast that first year went. Prince George is such a gorgeous baby boy. I read somewhere that Catherine and George has had play dates with her friends and their babies at Windsor castle. I wonder if that's true? I certainly hope it is, it would be very difficult not being able to go to a local playground and hang out with the other Mums for the morning. Maybe Mr Middleton could build a swing set and a sandpit in their garden, it certainly looks big enough! Then sell "Do it yourself playgrounds" through their business, now that would be something lol!! Yeah, and be vilified for trading on connections.But you're right Florence. Catherine does not get to enjoy a local playground with the other Mums. If she tried, just imagine the security detail needed. What do they do? Give the mums a break and push the swings? Wonderful post Charlotte! And beautiful pictures! I love the one of William kissing his little wombat on the head. Could it be that he remember how he was a little wombat too? LOL! Well, as a matter of fact, I love them all. It's too soon to with Cute Prince George a happy birthday but I am sure that Dad and Mum are preparing something very special for their little darling, "their silver line". Hush! What a lovely post! It reminds us of so much from the past year. But now there will be people in Kensington Gardens at 5:30 am, unless William stays within the Palace grounds. It seems to me that Kate is willing to give us occasional glimpses of George, for instance at the Father's Day polo game. She and William both provide updates as they go about their interactions with people. Updates the PR people would never give us. Nevertheless, the Guardian article about not turning the royal family, especially Prince George, into a 'freak show' no doubt pleases them immensely. The Queen is said to be seeking restrictions on the air space over Anmer Hall after planes flew over it very low for photos. 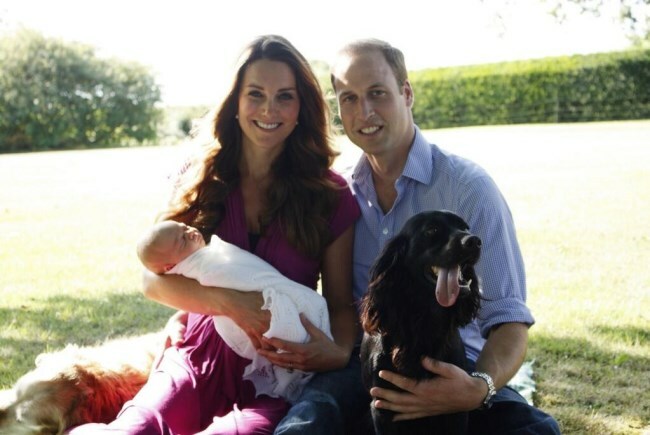 I hope our love for this family and for Prince George does not encourage a mindless voyeurism. Why on earth do William and Catherine think that tax payers should finance their lives if they don't intend to function as royals? Tax payers do not fund their lives, by and large. They are each wealthy privately, and Charles covers a lot of their lifestyle expenses. The bulk of publically funded renovations to their Kensington Palace apartment were necessary structural upgrades to preserve an old building. The Queen owns Anmer Hall privately. They have not retired from all public appearances. It can be argued that the more they go out, the more the UK has to spend on security and travel. Kate will cost Britons very little if she turns country mouse and stays home with the kiddies. I am curious to know where I can find the Royal Princess job description. Do they receive annual performance reviews from Parliament? I feel a Monty Python skit coming on. Charlotte: As much as I appreciate the time and effort you put into the lovely and informative posts, I wish you would please be more attentive to the Trolls who increasingly show up on the board, such as the above, whose only intention is to be nasty. Lizzie, I agree. With respect to bluehare, I didn't find the comment negative or judgmental, rather an expression of discomfort which I share. Comments like Anglophile's are uncomfortable because they are just so abrupt and inaccurate. We don't know their "intentions," just the speculation of many outsiders who repeat things until we start thinking they are facts. Facts are they have been out there working. Obviously, not as much as some would like, but I don't see a day when that will happen regardless of their actual workload. Greybird, thanks for the great job of explaining the financing. Pretty simple when you put it like that! Hate to say it but Catherine home with the kiddies costs the taxpayer more than most other young mums in the nation, even those on benefits. Without arguing about the Prince of Wales's income which carries with it an expectation of public duty, security costs alone are enormous. Catherine is guarded, sometimes with multiple guards, whether she is working or not. No one says a pence by having her at home. This is being taken note of. The queen is increasingly having to assume costs related to security according to recent reports and hired security guards may be taking the place of some of the expensive but wonderfully trained police that now guard the royal family. I have no objection to William and Kate assuming a somewhat ligher schedule - one or two engagments a week, so that there is ample time to be home with George (few parents today have that much time.) But if they aren't going to commit to public duties I do feel that they should cover the cost of their security, the single most expensive thing the monarchy costs the public, and consider reimbursement of some of the alterations to the interior of Kensington Palace since that work was put forward over other repairs to Buckingham Palace beacause William and Kate were expected to be working royals and needed a London base.
. Since they are privately very wealthy, that doesn't seem too much to ask. Anglophile - That is a very good question. I fail to see how that is trolling. I'd also honestly like to understand details of the position of those who believe the amount of work the Cambridges do is acceptable. I would love to be wrong because that would mean lives of the less fortunate are being changed several days a week. If taxpayers were to give me free luxury accommodation in the best neighborhood in one of the most expensive cities in the world, without any other freebies, that in itself would create in me and most of us, the motivation to give back in commensurate measure. Then there is the matter of priorities. How do they rationalize all the lost time? The Cambridges can't get it back. They have won the ultimate lottery in terms of global influence. They could significantly improve the lives of others if they both did say 30 hours per week of charitable work. Think of it, change the world but still be home by 3 or 4pm every day of the week. And change the world with little to no stress, inconvenience and plenty of free time left for shopping, shooting, yoga and Mustique vacations. Certainly nowhere near the stress level of a working class person. Trade places and you experience 24X7 on-site professional childcare devoted to your kid alone so you know your child had the best care available while you were at work. If George wakes up at 3am, you can opt to stay in bed while the best that money can buy night nanny tends to him. Your work clothes are immaculate and organized by someone else. Laundry and dry cleaners never cross your mind. Someone will have scheduled a pro to come by and do your hair if you like. And someone else will help you dress. Someone brings breakfast to your room and even draws your bath if that's what you like. Someone drives you to work while you relax in the back seat or read research notes staff prepared for you. Then when you arrive at work, everyone is thrilled to see you and show you how they've prepared (sometimes several months in advance) just for your visit. A handful of people who really can't afford it, are waiting with flowers they bought for you. Everyone bows/curtseys/applauds, hanging on your every word. Someone provides a carefully planned lunch. No brown bag ever again. When you depart, people applaud and cheer some more as you near the open door of the limo your Scotland Yard minders guarded while you were inside. The limo temperature was warmed or cooled to your liking before you get in. You're driven home while you do whatever you're in the mood for in the back seat. You're dropped 5 feet from your door and someone holds an umbrella if is raining. Inside, the place is spotless. No dirty tennis shoes left in the foyer by a kid who got home before you, no dirty dishes in the sink because you were too tired to finish cleaning up last night. Nanny reviews George's day with you if you like or maybe you just go straight to the gym downstairs. All of that and more done for them, and they somehow are able to rationalize their minimal work schedules. OK, wannabees and sycophants have at it. 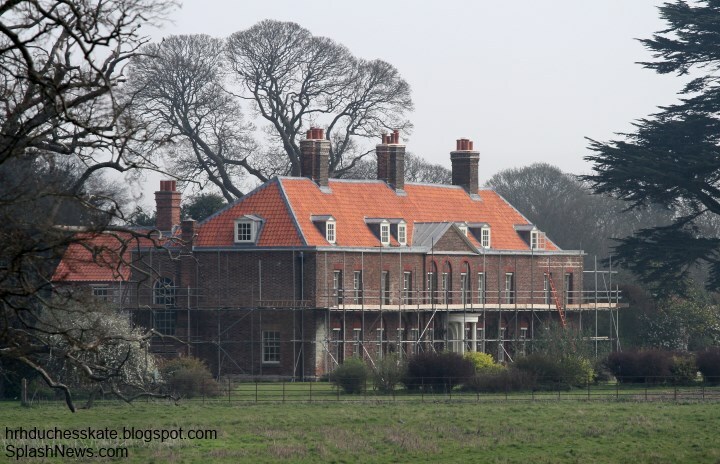 Tax payers do fund security and if the Cambridges do elect to stay a lot at Anmer Hall , this will be very expensive. I have beens staying away from this type of debates always because I don't know about it enough to have an opinion. But I am honestly curious about the source of the money to keep the royal families around? They do have salaries and expenses, right? Yankee from California. An opinion is just that a personal opinion. To be able to state an opinion respectfully has been a great bonus. I have no strong opinions either way but not allowing free speech and name calling belongs somewhere else. Just because you feel Kate is perfect does not give you license to name call. I always smile on the folks who are so free to bash anyone who does not share their opinion of Kate. Read the bill of rights, as an American you should work on tolerance. Bluhare- very well said, I quite agree with you. Sarah- I love what you said in your comment, very interesting points you made. I do love the RF, especially PW, Catherine, and PH, however, what you said is completely true, and it does make one stop and think (it did to me anyway). Oh, The Way We Were- the only thing I know for sure finance wise for the Royals is that Prince William and Prince Harry were left a trust by their mother, Princess Diana, that was split and they received when they turn 30 years old. Prince William received his and Prince Harry is about to receive his on his upcoming 30th bday (I forgot the exact amount, but it is several million dollars/pounds). As far as Catherine, I'm not sure to be honest. I know her parents are millionaires, perhaps they have given their children funds as well. And yes, the members of the RF do receive a salary (at least, I'm fairly certain they do). Perhaps someone with more knowledge of this will comment so we can know for sure. I hope that helps answer your question a little :). One more thing: Lizzie, Charlotte has a very busy life, and she takes the time out of that busy life to grace us with this wonderful blog. I think she does a wonderful job and she does monitor what we post. There was nothing wrong with what Anglophile asked. IMO, she was just asking a question that any one of us might ask. I think calling her a troll was out of line, way out of line. We have a very tight community here. We do not always agree, that is the beauty of it. When we don't agree, we debate it, like grown ups (for the most part). Yes, there are always a few who say something truely nasty, now those are usually the ones that would be accurately called trolls. And Charlotte does an excellent job in handling them and their comments when that happens. See, I am not in agreement with what you said, but I think I am being very adult and polite in my thoughts and comments about it, IMO. Excuse me, Anon 4:22, but where did I name call? How do you know I feel Kate is perfect? Where is your display of tolerance? I agreed with the spirit of a remark, that it made me uncomfortable -- expressed an opinion. What you did is illustrate my point that stating something as a fact does not make it so. And talk about bashing someone, that was a Master Class. Thanks for the sermon but you missed your mark. Bluhare, many times when I want to respond to a "fan" posting hate to other fans who ask reasonable questions, I see that you have already stepped in as the voice of reason. Thank you and I hope you and Charlotte have very nice days! This is Anonymous 04:22 my sincerest apologies to Yankee from California I meant my comments directed to Lizzie SF who made the troll call. Yankee, Lizzie did make a judgment. She posited that the only reason Anglophile asked the question was to be nasty. I don't have one single problem with anyone who takes umbrage at a question or a point made. I get very hinky indeed when people start questioning others' motivation and making personal remarks instead of answering or debunking the point made. I call it like I see it, and will continue to do so. bluehare, you are right. I guess many things written here are judgments but that word has a negative connotation to me and I thought Lizzie was trying to be productive. I dislike comments that seem to have the sole purpose of stirring the pot. Not speaking for Lizzie, but I felt that was her point - Anglophile's comment felt like a hit and run to me. You are a great example of one who provides thoughtful opinion and fact and I greatly appreciate you for that. Even if I don't always agree with your opinion, your perspective is one that I value and enjoy considering. "call it as you see it"? perhaps take off the blinkers and you might see more clearly. think you just lost the readers interest. Yay for having the discussion! I thought the attached article did quite a good job talking about how the Queen is funded. Charles' funding through the Duchy of Cornwall is similar to how the Queen is funded through the Duchy of Lancaster. This doesn't address the security costs, though, which as Anglophile has pointed out will increase with William and Kate living at Anmer Hall, as Kensington Palace has security on site and it's gated and guarded. Part of Anmer Hall's remodel involved converting some outbuildings in the security accomodations. Yankee: you are so exactly right. I took extreme exception to Anglophile's comment and did see it as a hit and run and stirring the pot AND being judgmental. That is why I responded as I did. The finances have been explained ad nauseum, and every time I turn around Charlotte is posting fresh things the Duke and Duchess are involved with. And still the ridiculous and pot stirring comment is "Do not want to function as Royals"
Well, enough is enough. When I see Trolls in action, I will call them on it. Sarah-giving W&K the benefit of the doubt doesn't qualify us for the insulting descriptions of sychophants and wannabees. Lizzie-disrespect & insults are not disagreement using valid points . Do read the way others disagree here & see the difference. bluhare, in no way do I want this to sound sarcastic, but I am smiling a little on my end. When W&K travel abroad on vacation, people have suggested that they should choose a royal property and stay put in order to keep the cost of security down. Well, now it appears that Anmer Hall may be an issue. I don't ever recall reading anything suggesting that the Queen should stay put behind the gates of BP, or Charles staying put at CH. I'm sorry, but if Camilla could have security at her pre-marital home where she runs away from the life she wanted so badly...lol...how can we begrudge W&K a home in the country? Lizzie, to be fair, we have seen trolls on both sides of the coin. I admit there have been times when I couldn't resist and I replied, but I do wish we could have a blog pact and ignore such comments because silence is the exact opposite of what they seek. Most important things first! Here is a link with photos from 16 June of nanny taking George for a walk around Hyde Park pond. He's so adorable! Lizzie SF 03:03 - Using the word "troll" is bullying. Joe from USA 03:33 - Labels like "troll" is bullying. Ignoring a bully never works. Lizzie SF hopes to silence anyone who disagrees with her by bullying them with name-calling. The only way to get bullies like Lizzie SF to stop her bullying is to stand up to them and my last post was an attempt to fight fire with fire i.e. give her a taste of her own medicine. Clearly it didn't work because Lizzie SF's 17 July post adamantly re-asserts that she has appointed herself judge and that she intends to continue bullying by name-calling. I too have always wondered about certain royal family members are rich in their own right. Beginning with the Queen she inherited from her ancestors monies that they earned in their own right etc. Diana apparently as well inherited from her ancestors... her monies apparently earning interest along the way. It is the only way I can understand all of this "are rich in their own right". And apparently the RF get paid for their job duties, well the Queen does. Just like a President and many areas are "free" or paid for by the taxpayers. The article above points out the Queen is worth well over 330 million in pounds. I think there is just a fascination in this financial area which is why this is so much discussed. Then we are lacking the information on just what are the job descriptions of each RF member whether it be full time or what is considered part time. The wealth of the Queen (private wealth) is going to be passed on to her son, and from him to his two sons. The two sons are never going to have to worry about money just from the private wealth alone especially if the monarchy were to no longer exist. Whatever is done with any taxpayers money is going to be under scrutiny in any country and definitely should be. I think it is so wonderful that Charlotte has provided us a medium in which to have healthy respectful discussions. I learn so much from you all and much enjoyment in being allowed to speculate. Sarah in Minneapolis: You have it entirely backwards. Those who make hurtful, nasty and inaccurate comments are the bullies and should be reprimanded. I can't believe it's been one year already and this precious baby had grown in front of our eyes. I remember being glued to the television as the family exited the hospital. It brought tears to my eyes. I'm so happy to see that one year on, they seem to be the same happy little unit with strong connections to family. I hope little George will have many happy years at Anmer Hall and can be just a normal little boy just as his parents and grandmother Diana would have wanted. I know people miss this family wherever they're on their off time but they are second in line and a happy family and privacy are so important at this point. I don't want to jump the gun but I also think we may have another baby to look forward to next year. Wouldn't that be fabulous? Warm hugs to everyone here especially fellow parents. Enjoy your children. They grow up too fast! CRIKEY !! For THAT much money I should have thought that the hem would have been even!! But the color was Lovely!! Maybe they are planning to have another baby in the near future, and so need another year or two to tend to their growing young family. I don't see anything wrong with that, but who am I? I LOVE this look back at the year and I'm looking forward to the official photo of George. Thank you! Thank you for this great post! I can't believe Gorgeous George is almost a year old! 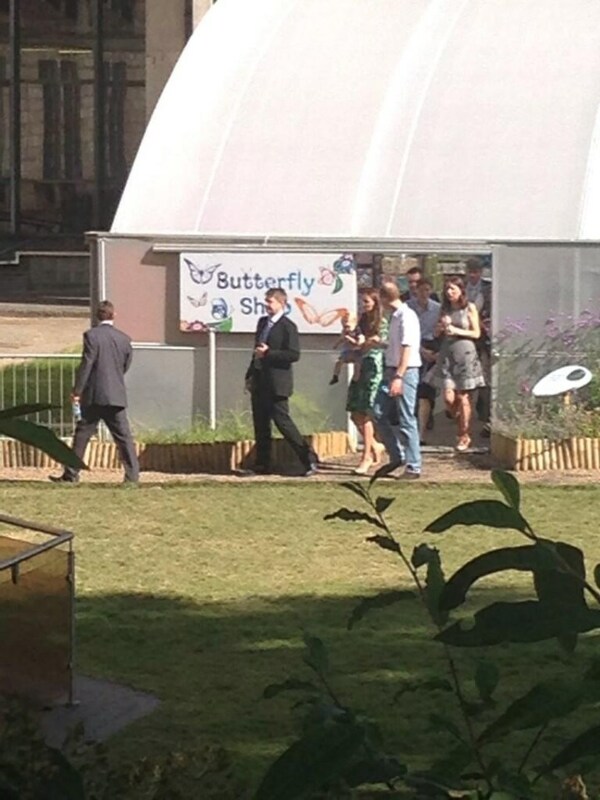 I'm hoping we see birthday portraits from the butterfly display at the Natural History Museum. Wanted to add my "two cents' worth" on the possibility of a reduced engagements schedule for the Cambridges. I'm wondering if this isn't really about them but about Camilla and Charles? C&C aren't really very popular. William and Catherine are so popular that I can see the need to remove them from the spotlight so they don't overshadow Charles and Camilla. With utmost respect to Her Majesty, we're moving towards Charles's ascension. I think Charles has been emotionally hurt throughout his life by simply not being as naturally likeable or charismatic as those closest to him. The Queen and Prince Philip are both very strong personalities even if they are so in very different ways. Philip, in particular, has always overshadowed Charles, especially in traditionally "masculine" pursuits, being much more of a natural as a military man. Charles's marriage to Diana was probably the most disastrous choice possible in this respect. Media and the treatment of the Royals really was different in 1981. No one had a clue that Diana would so totally eclipse Charles as a media magnet. Add to that the awful fact that for Charles, he clearly married the wrong woman (this is not meant in any way as an insult to Princess Diana). It's one of Charles's great tragedies that he didn't marry Camilla circa 1973. It shows the essential problem for him throughout his life-he couldn't make a decision and stand his ground, even for the love of his life. He couldn't stand up to his parents. Also, the British Royal family and aristocracy hadn't changed enough to accept Camilla as Princess of Wales. Her family were upper class but her great-grandmother, as a mistress of Edward VII, had set a precedent for the way they were regarded that Charles wasn't willing to take on. The Spencers were a better bet status-wise (having been several hundred years away from supplying the Royal Family with mistresses, not just seventy years!). Back to the present-I think William and Catherine genuinely want some privacy while having and raising a family. This, combined with William's general prickliness towards the media and the need to stop drawing attention away from C&C, may account for the proposed move to Anmer Hall. It's also apparent that William still wants to pursue his love of flying which is something he may have to do while he is relatively young and while his skills are still sharp and current. We may just have to face the fact that Charles must have his time in the sun unless he steps aside which I doubt he will, given the struggle through the Diana years, his own ego and the history of abdication in this Royal Family's relatively recent past. I believe that Her Majesty would never consider it because of the effects her uncle's abdication had on her parents and her own life. I'm sure she would try to influence her successors not to consider it either. What do you think, Charlotte? Best to all your readers. I think there's a number of factors involved. Several reliable royal reporters have repeatedly mentioned there is no desire for them to become full-time within the royal household. I don't think it's something they want for some time either so it appears to be a decision the royal family are pleased with. Charlotte Can you please post something explaining that the tax payers do not pay all the expenses for W&K. Many of your readers here continue to think that. I think you could shed some light on this topic since you live in the UK. And put an end to the thought that W&K are wasting tax payers money not being full time royals. Hope to see something from you on this soon. Right you are Anon 22.09. It is becoming increasingly tedious to have the same complaints over and over again, seeing that we have already discussed work ethics and funding beyond the beyond! Maybe a big sign "tax payers do not entirely fund the royals" and "w & c will not be working fulltime for a while yet" might work haha! Just being silly now, but really.. Does it need to be talked about again and again? Hindsight can be wonderful but I don't think the royal family would be nearly as popular as it is if Charles had married Camilla. She simply is not the most gifted of royals. She is said to be delightful and funny in private but she doesn't photograph well and she doesn't come off impressively in interviews. The British royal family was not having the best time of it in the late sixties and seventies. Diana will never get thanks from them for it but she gave it an incredible boast. While that wavered after the divorce, William coming of age has kept interest up. Canadian Friend, I agree with so much of what you say. It's true that William (in particular) wants privacy for his young family for as long as possible. But we cannot ignore that this works beautifully for C&C. The long term impact of this game plan remains to be seen, but if the Queen wanted W&K to play a larger role, they would do so. Like it or not. will pose less of a threat to their popularity. They can attempt to postpone...but they cannot avoid the reality of their circumstances. Otherwise known as karma. I never thought of it as karma, Royalfan, that is a whole new approach. But it makes sense, I must reflect on that.. Please expand if you have more thoughts, it's really an interesting way of looking at it. Charles moved to Highgrove around the time he married, and reduced his schedule considerably when his boys were young. The Queen spent time in Malta when her two oldest were young and she was still a princess. When she was in England, she spent time with her children. One can expect the royal family to follow tradition! Have I covered all the revenue streams Will and Kate effect? One thing to point out is that expenses ballooned because there are so many generations alive - in theory, there should be a reduction when Elizabeth and Phillip move on to the great beyond. No doubt Charles will claim "fiscal tightening" when he moves onto the throne and the expenses will reflect that - simply because there are two less senior royals to support and William will have full access to the Duchy of Cornwall. Florence, in a nutshell, I'm referring to Diana's popularity and the way it irked Charles and the RF in general. With all the time, money and effort Charles has put into campaign Camilla, before and since his second marriage, their popularity has as much substance as a house of cards. William, Kate and George represent the same eclipse factor that Diana did and that, IMO, is a good dose of karma. It does surprise me that the funding has to be so secret. Is the monarchy so vulnerable that it would be abolished if the true costs were known? Serious question; I've got no idea! That is an excellent question Bluhare. I have often wondered what the big deal is about telling the public where all the funding has come from also. I mean, we know that the host countries footed the bill for the last tour, as Moxie said. That part actually was made public. I don't remember though, did they really tell the public what the total cost of that was? It just makes me wonder why they seem scared to share any real information about funding too. Like you Bluhare, I have no idea. It makes no sense to me at all for them to hide it. Idk, seems worse to leave the public in the dark to keep speculating and coming up with a lot of outlandish ideas to explain it, just my opinion. CHARLOTTE-YOUR REPLY BELOW SHOULD BE IN ALL CAPS. Those upset with W&K need to read it so they understand. CanadianFriend-good points. HM tried hard to heal the abdication animosities--reached out to the Duke & Duchess of Windsor. HI CHARLOTTE! Would it help to shed some light on the W&K work ethic if you post some of the articles mentioned below? Great post, Charlotte. I have nothing new to add but would like to say that Kate is a very beautiful woman. Also, Prince George is one of the cutest babies I've ever seen. Such a little chubby-bub. Thanks for checking in, Jennifer. Good to hear from you. Wonderful post! I find it so interesting that many on this message board vilify William and Kate, assuming they alone have made the decision to not undertake full-time royal duties. Based on several articles I have read, there was never a plan (managed by the royal family) to make them full-time royals until Prince Charles ascends the throne. Queen Elizabeth has FOUR children who, along with their spouses, undertake a full docket of engagements. Plus throw Prince and Princess Michael of Kent, The Duke and Duchess of Gloucester and the Duke and Duchess of Kent -- there are a lot of royal family members undertaking events. They may not have the popularity of William, Kate and Harry but I believe keeping the third generation as "part-timers" for now is a fully-calculated decision at a higher level. When Charles ascends the thrown, his siblings will transition out of the spotlight. Now I completely see the argument of how can British taxpayers foot the bill for this popular young family and not see them frequently. My point is that I believe the family has made this decision, which the privacy seeking William is no doubt happy to embrace. But to think a couple -- who have been very deliberate about their choices and transition through major life milestones (marriage, having children) -- has merely shrugged off duty in a vacuum seems a bit naive to me. I would love to see them out everyday and think it would be a great PR move for the Royal Family, but I think there is a larger time table and plan driving their engagements (or lack thereof). From the Court Circular, illustrating your point: "The Queen and The Duke of Edinburgh this evening gave a Reception for the winners of The Queen's Awards for Enterprise at Buckingham Palace. The Duke of York, The Duke and Duchess of Gloucester, The Duke of Kent and Princess Alexandra, the Hon. Lady Ogilvy were present." Meanwhile the Queen's children and cousins and their spouses were also out attending daytime events. And William and Harry attended a cricket match for charity. Foreign travel expenses are not paid for by Charles - they are paid for by that country's taxpayers. Security is estimated at 300 million pounds - that is a lot of tax payer money and is not reflected in the 56p per person estimate. That sums it up nicely Anon 02.39, thank you. And Moxie, The RF visit those foreign countries by invitation of those governments- who feel they've benefited from a Royal visit. JO- You know, you do have a good point there. I forgot about that to be honest. I did read before W&Cs' trip to NZ & Australia, that those countries did invite them, with the knowledge that they were going to be the ones covering the costs (they knew that they would be doing this BEFORE they invited W&C). Very good point Jo. You know, that reminds me of English history now that I think about it. This is not something new, the host country paying the expenses for a royal visit. Centuries ago in GB, when a King or Queen went on progress for the summer, the host families/towns that the royals visited and stayed with (many who had actually invited the royals), are the ones who covered any expense involved. Whether it was food, drink, entertainment, lodging, and they did this with full knowledge beforehand that the cost of inviting the King/Queen would be to provide their every need. They knew this, but did it anyway, because they wanted to be able to say "yes, the Queen was at my estate and she had a lovely time, etc etc". So, my point is, that this has been going on for centuries. And also that back in those days the royals were invited, just as today, and the ones doing the inviting did benefit from the royal visit, just as today (which is probably why they didn't mind footing the bill). Sorry for the history lesson. It's just that this topic of the countries during a royal tour is so closely related to how the RF went on Progress (basically a royal tour, no?). Lovely post! Certainly enjoyed it. While I hate to start any sort of debate (hopefully I wont) I do wonder just how much money the taxpayers pay for their lives. I mean, doesn't Prince Charles' estate make 100 million a year or something. As a municipal employee I hear the whole "my tax dollars" sob story a lot but in reality only 2 cents from every tax bill comes to my office. So I would be interested in knowing what percentage of their lives are funded truly by tax dollars. It was recently released that the royal family cost the UK taxpayer 65p per person per annum. It was discussed in previous posts. People probably spend more on cigarettes, gambling and alcohol. Lol. Hi Florence! That's not really the point though- it's a really small amount per individual, but when you add that up it's actually a massive amount of money and many people believe that could be better spent. People aren't complaining about their 50p or 65p or whatever they pay, it's the fact that that small amount adds up to millions of pounds. And if I may add, Florence, this is a far healthier habit. LOL. But I agree with Royalfan, who understands my sense of humour here. Yes, royal watching for 65p per day is in fact a bargain. Up it to the full pound I say! Nobody could ever accuse W & C of not putting in 100% of effort into the charities they support. They always get excellent feedback from the places they visit. Quality not quantity. They are NOT the kardashians, and thank heavens for that. Doesn't include the cost of security (estimated 300 million pounds) and the cost to foreign taxpayers when traveling to and touring those countries. People also spend more on food, clothing, shelter, fuel and education - things they actually need and use. Great Britain is a monarchy remember. Of course they have to pay for the royal family, it goes with the territory, no?! Are the posters who are questioning cost actually British or from the Commonwealth? Do you think the royal family is expensive as far as upkeep goes? Do you think a president and family would cost less? Lol, very well said Florence! Excellent point made! There was an article recently- the NZ portion of the Cambridge's tour worth 68 million in advertising for the country. The total cost to NZ was 1.8 million. Probably a similar result in Australia. The cost of the security isn't know because the govt isn't telling what they are doing to protect people because it would be counter productive. Also it isn't just the Royals that have govt protection but govt leaders such Cameron, Clegg, etc. Security is payed by taxpayers all over the world and whatever type of govt the country has. Compare the protection of the First Family of the US to the royal family's, the royals do stuff the Secret Service would never allow for the President or his family such as ride in open carriages or fly commercial airlines. Hmmmm and I wonder how much revenue the Royal Family bring into GB MM and Gracie? If you are going to raise the debit argument then let's balance it with the credit argument too shall we? And AGAIN--the existence of the Monarchy provides jobs-directly & indirectly! The media would really suffer without them! Good point Simone. One does have to consider that the RF does indeed bring in the revenue into GB. Tourism is a big economy boost for any country. Many areas everywhere depend on tourism for their livelihood. Excellent point Jo, the media might crash without the royals lol... And paying for security would be a lot less expensive than dealing with the kidnapping or terrorist attack on royal family. Of course they are not going to reveal details, seriously... God Bless that anything bad never happens. Excellent post, Charlotte. Great fun remembering all the excitement of George's birth. I suppose I am in the minority in thinking their decision to decrease royal duties is all about trying to have a normal family life while their children are small, and that's the right thing to do. The Queen disappeared from the public eye for several years as a young military wife, and she was the heir to the throne. Why shouldn't Kate in particular have those precious years with her children too? Are royal visits going begging for lack of bodies to fill up the calendar? I doubt that very much. Both Kate and William will have decades to be on public parade and spend lots of taxpayer money on security teams so we little people can see her latest coat and hat. I feel that the criticism against them arises from obsession with celebrity. Who are we to insist on "give us young and glamorous!"? There are no rules for how many appearances they should make. The Queen doesn't seem to mind or want to slow down yet. Charles shares his mother's enthusiasm for royal duty. Harry is loaded with charm. There's lots of blue blood to go around. And Kate and William mostly pay their own way on their lavish lifestyle. William seems a bit wobbly on making up his mind, true; but perhaps his mother's tragic death made him skittish of public life. Maybe we will even see a King Henry one day, he can always abdicate. Looking forward to the new George portrait and perhaps news of an impending sibling in 2015. To Anon 22:00 - We don't wish anybody any harm, but Harry would be better king. Just opinion. He never complains about being royal or taking royal duties. William can't make his mind up. William and Kate have already had a decade before their marriage for an almost completely private life. They have had three years since their marriage with a limited schedule, much of it spent in Wales. They are both now in their thirties and some commitment to their role seems to be in order, still allowing time with George, much more than most parents enjoy today. Anon 23:02. Harry has far less to complain about, no? He doesn't have anywhere near the same weight on his shoulders and this is something he was aware of from a very young age. And now that William is married with a son of his own, Harry can smile even more. Nothing against Harry, but my goodness there's a difference where responsibility is concerned. I fully agree with most of what you say, Greybird. But, a king who "doesn't like England very much"?? Harry is an excellent prince, definitely charming and well spoken, and a great flier apparently, but he is still a bit wild and does not have a partner in life as yet. And I can't quite imagine him taking on the monarch's constitutional responsibilities. By the way, William and Harry had a game of cricket for charity yesterday. From the Royal Circular: "The Duke of Cambridge, President, United for Wildlife, and Prince Henry of Wales this afternoon attended a Cricket Match in support of United for Wildlife in the Home Park, Windsor Castle." Those who think William is shirking his duties like to ignore the charity events he attends. anon from Leo, I would like to see more of W&K for their own sake, but I have trouble seeing the current scenario as a lack of "commitment" on their part. If this arrangement was signed off on at a higher level (the Queen, Charles) for whatever reason(s), is it fair to hold it against W&K? royalfan- I can just imagine this scenario: William rings up the Queen- "Hello, is that you, Granny? Listen, Catherine and I are getting tired of all the bad press. I don't care what your plans are. Matter of fact, I don't give a never-mind what Dad and Cam want. We want more tree-plantings; more plaque-unveilings- all that important stuff. And don't forget the ribbon-cutting. The public thinks we should be out there doing these important things, instead of being home with a future UK king, and flying and going to charity meetings and events.. A few receptions wouldn't hurt, either. Bring on the tea and crumpets! " You should write a book, that's hilarious! You could call it "In the name of Duty". Or "For the sake of public interest". I don't care about tree-planting or ribbon cutting but bringing attention to many fine charities, hospitals, schools, visiting struggling cities, and not so struggling ones. Bringing attention to the charities supported by their own foundation, most of which we have barely heard of because they have never been visited. There is a huge amount of very valuable work the royal family does. If I didn't believe that, I wouldn't believe in the monarchy because they have only miminal other roles except for the monarch herself. To suggest there is nothing more to charitble work than ribbon cutting is not very respectful of the many fine people who give hours of their week doing volunteer work, many at hospitals. Some of this work is being done by aging royals. Some is being taken over by celebrities. Some charities aren't getting the attention they might. I don't know who is responsible for the way this situation is being handled. I don''t expect either William or Kate to work full time - they should have some time with George - but to take on a little more every week other than playing sports would seem to me to do them little harm. OMG Marg, you kill me lololol!!! That was great! Loved it! I'm sorry to say but being King is not just about being charming. How do we know Harry never complains about royal duties and William does? Ah yes, the press says so. The media have long created this image of William being reluctant, that they turned his and Kate's long courtship into a manifestation of reluctance instead of a determination to get it right and learn from the past. Whilst there may be some truth to it, one thing you can't deny is that William is a strong-willed man who doesn't take his future role lightly. He sad it himself in an interview, it's something he takes seriously. The media have always portrayed him as dull compared to party-loving Harry but Harry has the freedom that William can only ever dream of.Besides, I don't think being responsible and dignified is dull. Those are two different things. Yes, Harry is more relaxed in his engagements but he has more leeway to be so. William have to balance formality and informality because he is not just a Prince, he is the future King and must conduct himself as dignified statesman. He is not perfect and has misbehaved at times too during his younger years but he has remained cautious and responsible allthroughout because he has a great understanding of what is expected of him. Both Princes are charming in a different kind of way. Also, I think this call for them going full-time as royals is mostly just from royal reporters and royal watchers but it seems to me that UK public very much appreciates royals taking on normal jobs. Serving in the military have both endeared William and Harry more to the public because many believe that it gives them greater perspective and understanding of the people they are serving. I don't hear William saying he doesn't want to be King. I hear him saying he doesn't want to sit around waiting, not having a career until it's his turn to be King. His father regrets having given up his military career too soon. Why be so hard on William for not wanting to have to spend half his life sitting and waiting instead of living with purpose? This does not mean he doesn't want to be King. How judgmental and unkind people are. Tea and crumpets, indeed, Marg. Or as the DM would spin it....... "Willful Wills strikes again" LOL. I know you mean to be light-hearted Marge and I like humour too in the proper place, but it is rather slighting to all the royal family members who do work hard and bring attention to little known charities -- very important attention to those charities as it helps enormously with fund-raising. There is much more than tree planting and ribbon cutting although one would hardly know that from William and Kate. But I believe you've worked in hospitals and surely know how much good work volunteers do and how much support royal visits can give patients, staff and other volunteers. Bringing attention to the superb work that so many people do with little thanks and praise, is a wonderful and unique opportunity that the royals have. While many young men are as much qualified as William and probably more so, since they work full time at it to be helicopter pilots and need the job to support their familes. My mum was a professional woman who quit work to be home with me, but she still went out fortwo full days volunteer work a week. Sometimes I missed her and I had to stay with my nana, but she thought it was as important for me to see her give back, as it was to have time with me. I did charity work when I was in school, on weekends, when I would rather have been mucking about. After he retired my dad did volunteer work two days a week at the local hospital. And there are tens of thousands like us, if not more, who find a way to give time even though they don't have nannies or housekeepers to help. I don't pretend to understand what the queen thinks, about this, about Charles and his affair with Camilla, about her sister and her young lover. I don't assume she approves or has control of everything they do. Nor do I assume that William and Kate are making decisions about what they do entirely on their own. But there is getting increasing damage to their reputations and they are the ones who will pay the price. People aren't loving Camilla more because William and Kate aren't working or paying more attention to her. People are asking what the purpose of the royal family is if their most noted young members seem to have huge gaps where they don't do anything. These days, other than the monarch, doing good works is what members of the royal family are about, and there's not much point in having a monarchy without that. A tree planting or ribbon cutting is just a symbol of the joy they bring to people they visit and the attention they bring to the work done by those people. A single visit can be a huge boon, to both large and small charities, Towns are delighted when royals come to visit, it brings them tremendous amounts of attention. I am concerned about William and Kate. A lot of their appearances seem to involve playing games (for William) and fancy celebrity parties. I admire Kate's work with hospice but it is very sporatic. I would be happy to see William and Kate do one or two serious engagements a week, leaving plenty of time for George, and for them to begin to show us what kind of future king and queen they will be. from your two responses, It seems that you have taken my meaning in the opposite direction than I intended. MORE charity work- yes, involving sports for these young, athletic persons. All three do well in sports and are interested in them. I don't understand why they and their charity work should be devalued just because they use the gifts they were given in order to serve .The "games" they play are CHARITY events or events that support industries vital to GB's economy. There will be plenty of time for ribbon-cutting, plaque-unveiling, etc. when they are older .The cousins are at least in their seventies. Do you really want to see the Duke of Kent dashing down a field on the back of a pony? No more than I want to see W&C&H do anymore plaque unveiling for now. What I was saying is -what the younger royals do is apparently not valued by some--i say there is a time for ribbon cutting and a time for supporting charities through sports. I was trying to show how people who support sports for charity must feel when it is devalued and called "playing games." As they used to say, "turn about is fair play." PS I would be willing to bet money that the Duke of E. would love to be out there, dashing down the field on his pony for charity. Ask him what he thinks of ribbons and plaques. For that matter, the Queen would probably relish being allowed to chase around on a polo pony. Hospital volunteeting is great. I volunteered as a teen. I also met two Olympic skiiers, from Italy and Spain in beds side-by-side -in the same room- just try filling their water beaker without getting pinched! Don't know what I would have done if they didn't have at least one leg each up in a sling! As far as visits to villiages and towns, it is hard to miss the excitement on the faces in the crowds. It is a great way for royalty to be "seen." It is also an enormously expensive proposition, both for the town and for the trsvel and security of the royal. Just for fun, imagine that money put into a youth recreation/work facility, for example. The mayor can unveil the plaque. I really believe that is what a William and Catherine reign would look like. Charles and Camilla- not too sure, although Charles has a good start on the relevancy thing. Queen Elizabeth and the cousins are doing things the way they were taught to do them. Anyone for cucumber sandwiches with their Darjeeling? Anon from Leo... I've noticed that too -- they are playing sports to promote causes and operating in official capacity at a lot of sporting competitions. It creates a juvenile impression of them. I find it interesting that we never see them attending cultural events as an audience. The only one I can remember hearing about them attending is Cirque de Soleil. It seems theater, opera, orchestras and the like are not their cup of tea. Marg - I don't "look down" on athletics - however using athletics as a "charity" awareness/fundraiser is somewhat self-serving. Playing polo is playing polo - PR folks figured out if they get businesses to sponsor it for charity - it looks better for them as royals who play polo on the weekends. Businesses get the write off and look like good guys. The royals (and the rich) get to play sports, the businesses get a lesser tax burden, their charities get the money. Everyone gets publicity. It is Public Relations at it's finest. I am going to say something controversial - but why is the heir to throne. William, so focused on animals on another continent? Have all the problems in his country, and the Commonwealth, been solved that he can spare the time to focus on this area? Sigh, Moxie, really? It has been my experience that when there is a charity event, be it sport related or not, that any proceeds from that event goes straight to that charity to help them. And, IMO, if the royals are playing in a polo match for the charity, that is going to attract more people, hence more money for the charity. I'm sorry, but that seems like a win win situation to me. The charity gets more $ that they desperately need and everyone gets to have fun (playing or watching) to get the said $ for the charity. Personally, I see nothing wrong with playing sports for charity, it is done in this country almost every single day. Moxie, isn't it about the charity? And in saying that, then isn't it best to have events that will draw the most people and therefore the most $ they can get? That's the only point I'm really trying to make. Juvenile? The Queen races horses and rides ponies in her late eighties. Prince Philip drives carriages in his nineties. The Queen once based a long section of her Christmas message on the importance of sport(s). This is Britain we're discussing, after all. William has often visited Africa. He became concerned about its endangered animals a long time ago. I don't know whether he can influence cultures that import animal parts for extremely questionable medical purposes, but it is certainly an issue that needs all the influence it can get. Some of these animals are in the Commonwealth, in nations which depend on tourism, and some species are in danger of extinction. I admire William's focus on preserving them. I have to say, that although the first picture of the George was taken by grandpa, I LOVE it. I think it is a rare glimpse into the closeness the family shares with the Middletons. I love Kate's smile in it and it's one I haven't seen very often on her, and I imagine it's because her dad took it. I love it too and instead of being snarky, people should be happy that they were treated to a rare intimate moment. Bet they won't make the mistake of letting the public get that close again. There was no date mentioned for when the course was taken-AND speculation that it was some time ago!! With thanks to the person who left a private comment alerting me to a specific site! anon 22:57- Just re-read this. It may come across as angry or snarky; if so ,I in no way mean my comments to be directed at you personally. I just get so frustrated with the greed that prompts the printing of such stories. I may be wrong, but I believe the cooking lessons took place when William was in the Falklands. At any rate, I doubt it was "news." that story and the regurgitation of the "3 kitchen" story were examples of the re-recycling the tabloids are fond of doing on a slow news day. How about just leave W&C out, rather than re-cycle stories that mention Catherine being ill, for example, to feed the pregnancy stories they print. It is self-perpetuating. All they have to do is drop a remark and the public takes off from there. It is a shame that stories like that over-shadow the few well-written and researched articles that may be over-looked, because they are often about "uninteresting" topics, such as charities and the good that some do. Yes Marg I couldn't agree more. Today E! News published this ridiculous article on their site claiming Kate was pregnant because of that coat she wore to the Tour de France engagement because it was zipped up completely, and how her "clothing choices have changed" but actually she still dresses the same and claimed how she was holding a clutch and bouquet of flowers in front of her stomach to conceal a bump. Ha! Omg she always does that. They then ran a segment on their E!News show repeating the same thing but threw in the "oh yeah but she was at a wine tasting so you never know" personally I don't think she's pregnant. Not with an upcoming visit to Malta, and knowing how her first pregnancy was and how she can become unexpectedly ill at any moment. She wouldn't risk going overseas. I thought the news story came from the woman who was in the class with Kate years ago, brought it up now to promote something she is currently doing, but I could be wrong.... I don't even think it had anything to do with pregnancy rumors or Jessica Hay until readers started misapplying misinformation. I didn't mean to offend anybody, but I was totally surprised. Why Kate would need a culinary course? The whole story is just unbelievable. And many sources abroad write Kate may be pregnant. I remember W&C said they'd like to have children in very close ages so the news is quite possible. I hope this time she feels better during pregnancy. And I think Charlotte might write a new chapter: Kate loves: Charities. It would be cool ;) What do you think Charlotte? You mean, "Hats off!?" ESTI? ha! Marg, excellent comment!!! I totally agree. Yes, they do a lot of sports related things, but as you said Marg, they are for charities (directed at those saying W&C&H are just playing games). Again, very well said Marg! anon 09:47- I wondered why a television chef would be taking cooking lessons with a bunch of amateurs Answer? She wasn't a chef when she took the class "years ago." No date was mentioned for when the class happened--so likely it was some time back! THAT was also mentioned as very likely. Yesterday was my 67th birthday. Thank you to all my friends on this site who helped me get there with their encouraging messages, good wishes and prayers. I never expected to see last year's birthday, much less this year. But this year I'm especially looking for to Prince Chubbycheeks' first birthday next week! So very happy for you Eve! You are truely an inspiration to others! I hope you had a wonderful birthday! You deserve the best! Take care Eve and may you have many more birthdays to come dear friend! Happy birthday Eve!! Life is a gift, try to enjoy every second.. Many happy returns of the day Eve! Good Health to you. Happiest of birthday wishes to you, Eve, and please do keep on celebrating for many, many years! That's great news, Eve. I'm looking forward to wishing you a happy birthday next year too!! Lots of July birthdays. None more precious than yours, Eve. There's some pretty good debates going on, on this blog regarding W&K and their work or lack of work. My opinion is pretty much somewhere divided in the middle. Do I think that William taking a transitional year off to figure out what he wanted to do was a good idea? No. Because he is a man in his thirties, he should have some kinda direction by now. Now hear me out before someone gets angry, I understand he is not like the average man. He is royalty, like it or not that was the life he was born into. I feel like he wants to have his cake and eat it too. He likes having the royal lifestyle but also wishes he could just have a quiet life with his family. If he keeps this up in a few more years it will not bode well with the public. I also think it was on poor form for them to have extensive renovations done on KP if they knew they were going to base themselves at Amner Hall. The "two kitchens Kate" story put out some bad press that I feel they tried to rebound from. Which they certainly have at the moment. Being in the public eye is tricky. Those same press that bought you up, praising your every move. Can take you down. W&K are media darlings at the moment. Buy if they keep up this back and forth wavering between being a normal private family or a royal family. It will tire quickly. I think in my opinion, they still aren't completely aware that the press can turn on them. They're in the golden years right now. Young family, new baby. Life is good. But if they get to be 40 still saying "well I'm transitioning I don't know yet" it's not going to go in their favor. You're doing an amazing work on this page, always following you! I wanted to ask to you and all the girls here a quick "etiquette" question. I'd like to write a birthday card for Prince George's first birthday and I was wondering if it's better to address to him or to his parents. What do you think it's more appropriate? 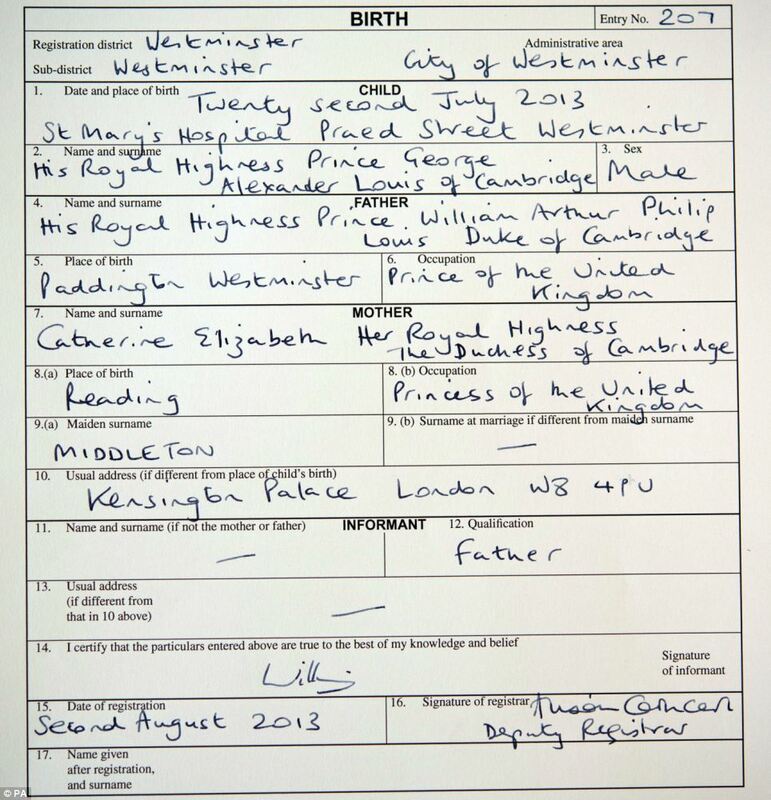 If I were addressing such a card, I would place Prince George's name on the top line, and "in care of" his parents' names below it. Not an etiquette expert by any means, but it seems appropriate. I ave sent a few cards to George and I always address to him. HHR Prince George Cambridge, then send it to Clarence House. And I have always rfeceive a response back. Happy birthday Eve - wishing you all the best! Trying for the third time to make an entry--keeps wiping out what I write!! Pity such a lovely article about a delightful child has once more returned to the usual moan about the Duke and Duchess. Prince William is in Coventry this morning for the inauguration of Centenary Field in Commemoration of the start of WW1. No publicity until this morning ,so wonder if security is a for the two Princes with recent military service. It must be obvious by now that Catherine's preference is to care for her child and like everyone else, she should have that choice. Anyway I doubt she has the amount of help suggested on an earlier entry---the press would have soon reported if there was more that the housekeeper and the nanny. If the Queen were not happy with the situation she would do something about it. I note she seldom invites them to palace receptions and never yet to an incoming state visit (Banquet), preferring the Kents and Gloucesters. If they were invited, they would be there. If they were to do more the transport costs of visits would be met from the Sovereign Grant---with consequent screeches about spending more.or else others would have to do less. From the moment I came back from my honeymoon, beloved aunts and grandparents were always asking if I were pregnant yet--it drove me mad. How much worse for Catherine when all the world's newspapers keep asking the same. Earlier in the week, KP stated that the Duchess had not spoken for many years to the so-called "friend" in the US, who opens her mouth too often.When or if she becomes pregnant again it will be announced in due course. The tax payer does not support William and Kate. The Crown Estates raise far more than is spent and for those who suggest that these estates are the property of the government, they should visit the exhibition which contains receipts for the purchase of several of the Royal palaces. As I understand it, the agreement for the exchange of this property for for a grant, has to be renewed at the commencement of each reign. Prince Charles might very well decide to take them back, when he inherits. The Duchy of Cornwall is now supporting five members of the family instead of one and people complain that the tax is lowered. A presidency would be much harder on the taxpayer and for much less. JEAN-great post- AND all best wishes for your new married life!! Great post Jean! Here is a video of that event. Please watch and enjoy! Thanks so much for this wonderful review! Since we are reminiscing-I will share with you that I was off from work the week that Prince George was born, having a stay-cation since I take care of my Mom. I feel so lucky that I was able to be home when the news broke that he had been born (I was hoping for a boy!) and to be able to see them leave the hospital the next day. It was truly the highlight of a very challenging summer for this caregiver daughter! I love William, Kate and George and your blog is AWESOME! God Bless "Little Duke" and his beautiful family! P. S. Happy Birthday Eve!! Many, many more! Amy- "little Duke!" i love it! I also like your cheerful, positive attitude, in spite of challenges. You and Eve and a number of others here have a lot in common. Amy-- I am sure that it means the world to your mom that you care enough to take care of her!- and reflects well on both of you! ESTI - I am a bit puzzled by the concept of spanish names but I am optimistic you will manage to clarify it for me. Let's stick to the example of Maria Teresa Turrón Borrallo. Since she was born during Franco's rule, "Maria" was given to her by default and her parents didn't have a choice. Right? Her REAL first name is "Teresa". "Turrón" is her fathers family name and "Borrallo" her mothers family name. She would be called only by her intended first name and her fathers family name: Teresa Turrón. While the mothers family name which comes last is part of the formal name but not actually used. Is that kind of right? it's odd that no one has reported on these photos, though, seeing as new pictures of Prince George normally spread like wildfire. Richard Palmer has made a few vague comments on twitter but that's it? What a treat to see little George out and about and appears to be hardly noticed. He sure is a cutie. I imagine this happens a whole lot more than we are aware of without anyone noticing. The British media, a lot of royal bloggers etc are purposely avoiding them. It is very much believed William, Kate and the Palace are very disappointed pap photos are being taken of George with his nanny. The concern is will he be harassed by paps throughout his childhood. Apparently these are not the only photos of George and Maria. Other sets are clearly behind the bushes stuff and haven't seen the light of day. Oh, I'm sure that William is not happy about these photos, but if they released photos more often, these would not be the "rare gem" they appear to be. The more they try to shield him, the more daring the photographers will become. 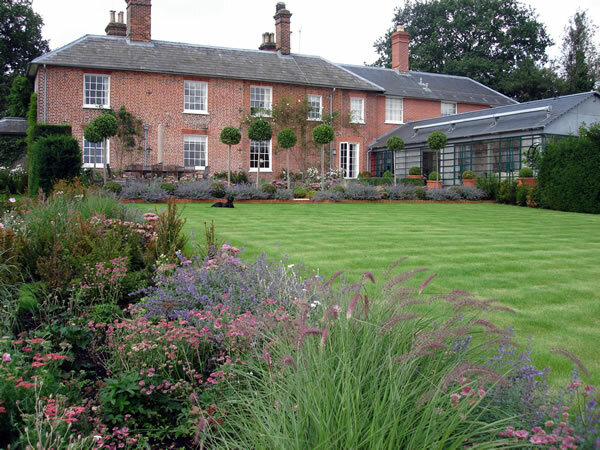 This scenario may have a lot to do with their desire to stay at Anmer Hall. I agree with royalfan. They can control the situation by regularly releasing photos and information. The nanny and George are out in public. The family owns enough land that they can raise the child out of the press eye. I think it is unreasonable to expect that folks would not take a picture of the royals in public spaces. Paps, Cell phones, whatever. It is a weird thought pattern to claim "I am Royal, call me Your Highness! But do NOT take my picture!" Even more difficult yet: nowadays there are surnames that are being lost, because that family had only females, well, in that case the mother´s name can be the first...and in noth Europe these days they can choose which is the first..